The first mass in the vicinity of Tiguert n'Ait Farss was found on January 17. The find location is situated on a Pleistocene alluvial terrace on the eastern side of the Tiguert canyon at an altitude of 1500 meters. The delta shaped specimen has six surfaces, a slightly convex front side and a concave rear side. The specimen shows no signs of orientation (the assignment of "front" and "rear" surfaces was made for differentiation only). 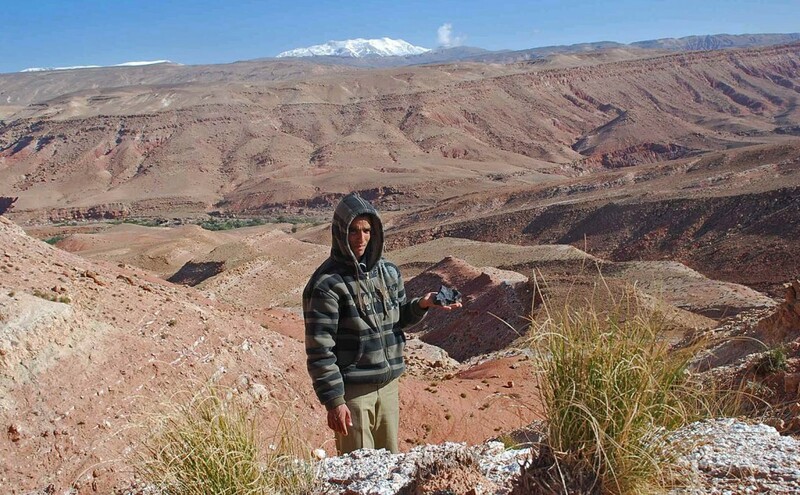 The first mass in the vicinity of Tiguert n’Ait Farss was found on January 17. The find location is situated on a Pleistocene alluvial terrace on the eastern side of the Tiguert canyon at an altitude of 1,500 meters. The delta shaped specimen has six surfaces, a slightly convex front side and a concave rear side. The specimen shows no signs of orientation (the assignment of “front” and “rear” surfaces was made for differentiation only). The 2 kg meteorite shows a fresh coarse primary fusion crust on the front and the flanks. A few patches show distinct contraction cracks. The rear surface reveals a textbook example of secondary fusion crust that is just beginning to form. The surface texture is coarse grained and uneven, the structure of the fragmented rock can still be seen under a thin sooty coating. Ridges and protrusions have already been smoothened by ablation but most of the surface still has the appearence of a fresh fracture. One more small surface on the tip of one corner shows secondary fusion crust. It is in the same early stage as on the rear surface. Obviously the meteorite suffered a violent in flight fragmentation. It’s noteworthy that on several surfaces of the meteorite small patches of the primary fusion crust are replaced by secondary crust in various stages of forming. This indicates that shock and stress accumulated during the ablation phase successively lead to flaking of the crust. When the meteorite impacted it first hit the ground with a corner of the rear surface. This caused a 3 x 3 cm corner to shear off. The missing material was mostly turned into a fine powdered dust and mixed with the soil in the shallow impact pit it created. A few more smaller damages and white impact marks bear witness of a rebouncing or subsequent rolling over the ground. The matrix shows only very little signs of oxidation and displays no obvious difference to the first meteorite finds of early January. 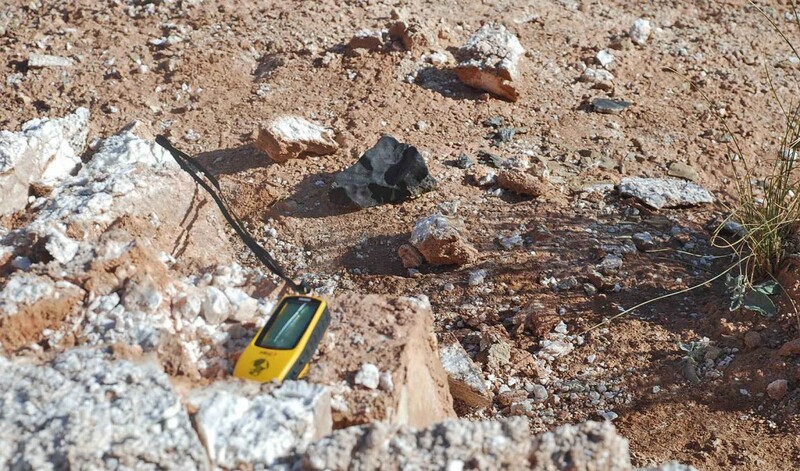 On February 15 a nomad from the vicinity of n’Ait Farss reported the find of a ~1.5 kg meteorite. The specimen was found while searching for meteorites of the Tamdakht fall on a mountain terrace opposite the village of Anakhsa. Since the finder was previously asked to leave new find situations undisturbed to allow photographing and measurements on the site, he marked the spot and left all fragments in place as found. Two days later, on February 17 the new fall site could be documented by M. Aid. Situated at an altitude of 1,545 meters the fall site is overlooking the Anakhsa canyon and the village itself. The meteorite impacted on the edge of a limestone outcrop intersected with marl layers. The weathered surface layer of the rock, which is up to 7 cm thick at the impact spot, was shattered into many fragments within an area along the edge measuring 20 x 30 cm. No impact angle could be determined, but most of the limestone and marl debris from the impact was distributed in a fan shaped pattern with a radius of ~6m, mostly east- and south eastwards. The mass with a pre impact weight of approximately 1,500 g hit the edge of the rock outcrop with one of the broad edges and shattered the weathered edge of the rock. Parallel white impact marks along the meteorite’s broad impacting edge clearly indicate the direction of this movement. Subsequently and with one of the short edges the meteorite hit the red clay soil, where it left a 5cm deep impression, and came to rest 70cm from the base of the outcrop. In total, 1,490 g of this meteorite could be recovered. 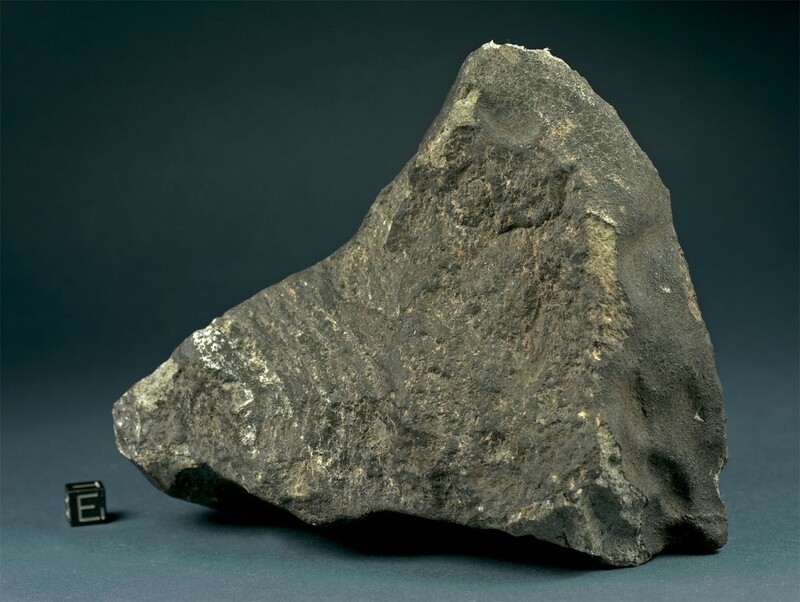 The relatively intact main body of the Anakhsa 01 mass weighs 1,407 g. The meteorite is of triangular shape and has five surfaces crusted with rich primary fusion crust. The specimen shows large, shallow but well developed regmaglypts. Along the edges of the impacting surface several fragments chipped off. These were strewn around the base of the outcrop and in the closer surrounding of the main body. The fusion crust of the meteorite shows little to no signs of oxidation while the fractured surfaces show rust halos around the iron aggregates. 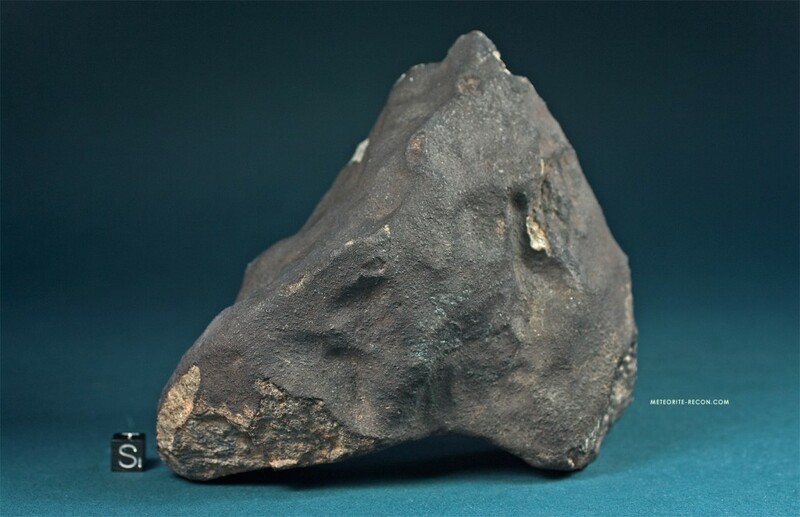 Although the fall of the Tamdakht meteorite occurred 59 days before the meteorite was found and documented, the overall impression is that of a hardly weathered specimen. A velvet textured fusion crust is still showing the characteristic luster of a fresh fall. Low temperatures and a cold and mostly dry weather since the fall favored the conservation of the specimen. The Anakhsa 01 mass represents the most westward find at present, thus marking the beginning of the distribution ellipse of the Tamdakht meteorite. As research in the field is continuing it can be assumed that smaller masses will be found further to the west. (Status of February 18, 2009).